Have you met Judi at The 1829 Farmhouse? 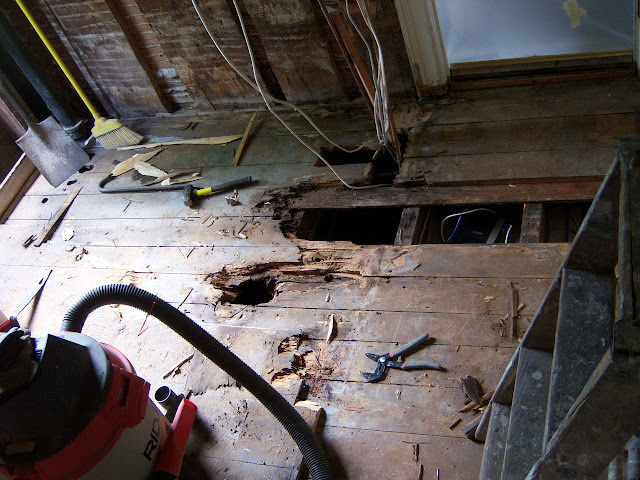 She is sharing her love of thrifting while renovating and loving her 1829 farmhouse. I was quite enamored with her bathroom redo and she has kindly agreed to letting me share it with you today. Her renovation, which took a year, was well worth the effort and spoke to me, not only for its beauty, but because it was done on a budget and with many repurposed materials. Here is the before. oh my!! and here are some after photos. 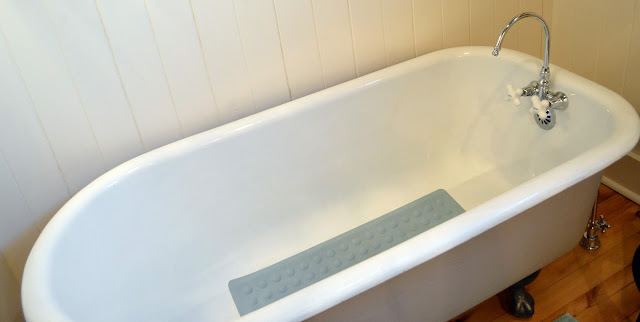 wonderful old vintage tub she found on craigslist for $40. wow. 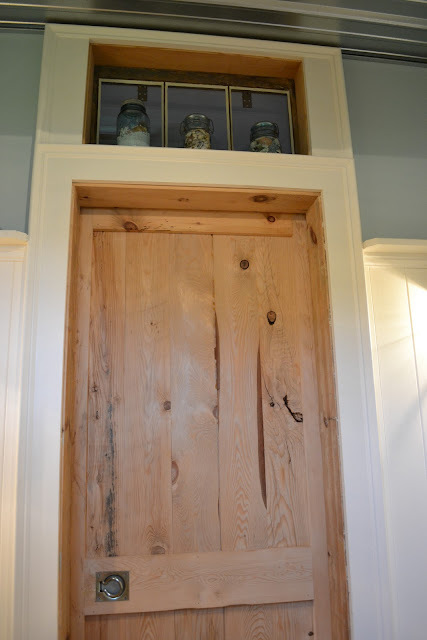 barn door using reclaimed wood from her home, with a transom light rescued from her basement. wood paneling reclaimed from her master bedroom. 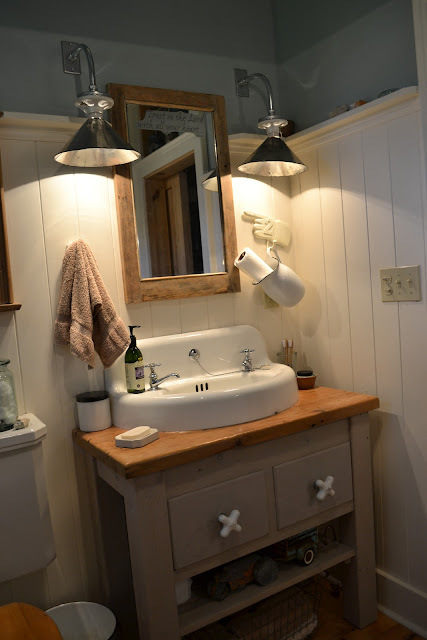 I love this vanity, which was created from wood pulled from the wall. I think you will agree that it is wonderful and to see more be sure and stop by her blog. 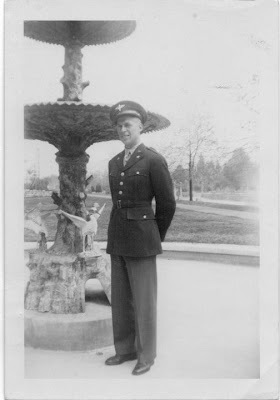 On this Veteran's day, this blog post is dedicated to all the veterans who have served our country, but especially to the memory of my late father, Reece Holloway who served, fought, and was a POW in WWII. Wow Laura, that is indeed impressive! That vanity! I love the look of this bathroom. It just makes my heart sing. She did a great job. Love the vanity...and what a nice tribute to your dad. thank you SO much for the feature! i especially appreciate the tribute to veterans as my dad also served in WWII. he was a radio dispatcher and passed away this past march. he would have been 90 in july. *i so enjoy seeing old pictures of men in uniform-they always look so handsome. I hope you have a great weekend, sweet friend! This is an amazing transformation! They have nerves of steel! Thank you for sharing this! I love it! I also love that you honored your Dad. He was in the great generation! My Dad is 93 and a WWII air force veteran too. I'm glad you stopped by my blog so I could find your lovely blog! I'm a new follower! hi..thanx for following me, i am now ur newest follower. happy blogging! This is such a neat post. 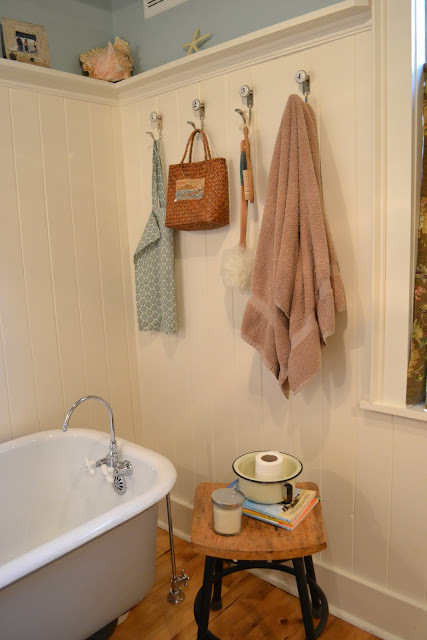 I LOVE what Judi did with her farmhouse bathroom! I'm always amazed when I see these wonderful makeovers. Also, Your tribute to your father at the end of this post is so very touching. We are grateful for his sacrifices for our country. Thank you so much for signing on to follow my blog. I really appreciate your kind comments on my tablescape. :) I'm sorry I'm so slow responding; this time change always knocks me for a loop, and then we've also had a really busy weekend. Have a wonderful week! This post reminds me of my own bathroom remodel. I love your blog. I feel right at home here. Wonderful bathroom remodel. Love the cottage/farmhouse feel. Thank you for joining me at Home Sweet Home!